Newcastle University researchers suggest that the protein in bacon and other meats is quickly broken down into amino acids, which rejuvenate neurotransmitters damaged by too many drinks the night before. This looks like an epic combination of two taste bud ticklers, bacon and hot sauce. At 7.99 I say why not. Here is what ThinkGeek has to say about it. Let's think of matches made in heaven. Chocolate and peanut butter. Peanut butter and jelly. Jelly and cream cheese. Cream cheese and sugar (aka, cream cheese frosting). Sugar and anything. Anything and bacon. It's been said that there's nothing that can't be improved by the addition of bacon and here at ThinkGeek, we're determined to test that hypothesis as rigorously as possible. We've tried just about every new bacon product on the market and share the very best with you, our bestest friends. Bacon Hot Sauce combines two things near and dear to our hearts - bacon and hot sauce. You know the expression "When Pigs Fly"? That's what chicken wings dipped in Bacon Hot Sauce taste like. Impossibly good. Piglets sprouting scrumptious flying appendages good. 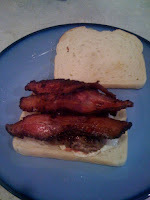 Bacon Hot Sauce is also amazing mixed into hamburgers or sprinkled on some otherwise lackluster pizza. But our all-time favorite is the Bacon Mary, made with tomato juice, vodka, Bacon Hot Sauce, and a spritz of fresh lemon juice. And instead of a celery stick for garnish, we stick in a crisp slice of bacon. Perfection. Looking for that unique special gift for the hard to buy for bacon lover on your list? 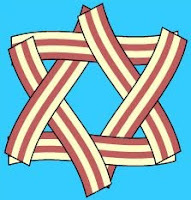 Well, skip on over to ThinkGeek and pick up this sweet looking hand-painted silk Bacon Scarf for only $56.99. So my wife sent me this picture. A coworker of one of her friends received this for his birthday at work. It was caringly made by his girlfriend. Now this is special, a few dozen tasty morsels of bacon arranged in a beautiful bouquet! A quick Google search provided many recipes/instructions for the creations including this one at Fast Company. This reminds me that I heard that the people at Edible Arrangements were marketing their bouquets for Father's Day. In my opinion, Epic Fail. On the other hand which Father wouldn't love to proudly partake in a Bacon Bouquet. I hope to see one soon from my wife or from any one, please. The other day I stopped by the local Haggen's meat department for some dinner. We were having sausages but I was enticed by the Gorgonzola Angus Beef Patties they had. I picked one up along with the sausages and a pound of their pepper bacon. I had some pepper bacon left over and decided it was time to create a burger. 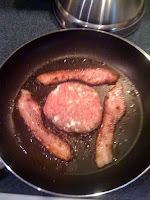 I started cooking the bacon up in the frying pan and dropped in the patty. Almost every burger I see on Drive-ins, Diners and Dives is cooked on a flat grill so I decided to bypass the BBQ tonight. I toasted up some sourdough bread spread on a little mayo and I was set. Someone tweeted a link to a pretty amazing website the other day, no not http://peopleofwalmart.com/ which is pretty glorious, but a little website called www.Scanwiches.com. Basically it is a website with cross section scans of some pretty glorious sandwiches. I will be honest, I would love to dig into pretty much all of them, minus the tomatoes. A good portion of them include bacon of all types. If your sandwich creativity is lacking I would suggest you head over for some masterpieces!